My hero, as typical as it sounds sometimes, is my mom. She’s my hero not only because of her dedication in raising me and my three siblings, her accomplishments professionally, her commitment to helping others and her unwavering faith but also for the way in which she does all of these. She has never done anything for attention, praise or gratitude, but simply because she has a tremendous sense of compassion and love within her that she is willing and eager to share with all. I know that all of the things that I value about myself today are a reflection of her. I am tremendously close with my siblings and I know it is because my mom has led by example. She has always emphasized what an important role her family plays in her life and how much she loves and respects her brothers and sister. I always go the extra step to let someone know how much I care or how special they are to me. I know without any reservations that this quality stems from the numerous letters and cards my mom has written to me, celebration meals she has created for me and special mementos she has gone out of her way to find for me. My mom filled my childhood with so much love and she continues to do so today, always letting me and my siblings know that we are her top priority. My mom is my hero for the way she is able to put others before herself and set an example for those around her. 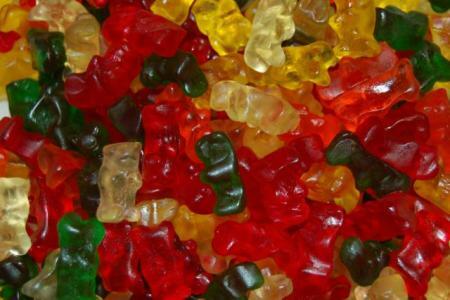 I strangely included a picture of gummy bears because it reminds me of an event that is quintessentially my mom. I had been working over the summer and went into work one day and was horribly sick. By the end of day I was feeling absolutely awful (the heat probably didn’t help) and my mom surprised me by picking up with a bag of gummy bears waiting in the car and told me that after the day I had, I deserved a treat. It was a really small gesture, but I loved that it showed someone had been thinking about me during the day.